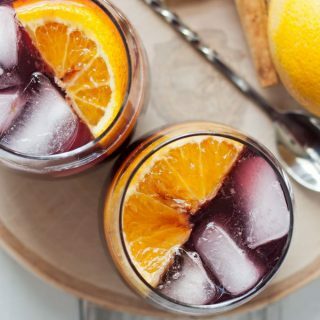 This orange red wine spritzer is a great cocktail for any season. Mix up a batch of cinnamon simple syrup, grab a bottle of your favorite red and try this drink today! Summmertime…. in the city. I am a huge fan of cocktails and this one is a favorite. Thirsty Thursday is over so it’s Finally Friday. That can be a thing, right? I’m okay with it and I hope you are too. I feel totally inspired to write a cocktail recipe after a quick one-two trip to Georgia and then Barcelona. I drank wine in copious amounts on both trips so it felt fitting to create a wine cocktail. When I get an idea for a cocktail, I run to the store and buy things. Like flavored liqueurs. Or funky strainers. Maybe a new cocktail stirry spoon. I think there is a correct name for the cocktail stirry spoon – you know which one I mean (the one with the really long handle) but I don’t know what it is. Cocktail stirry spoon it is. 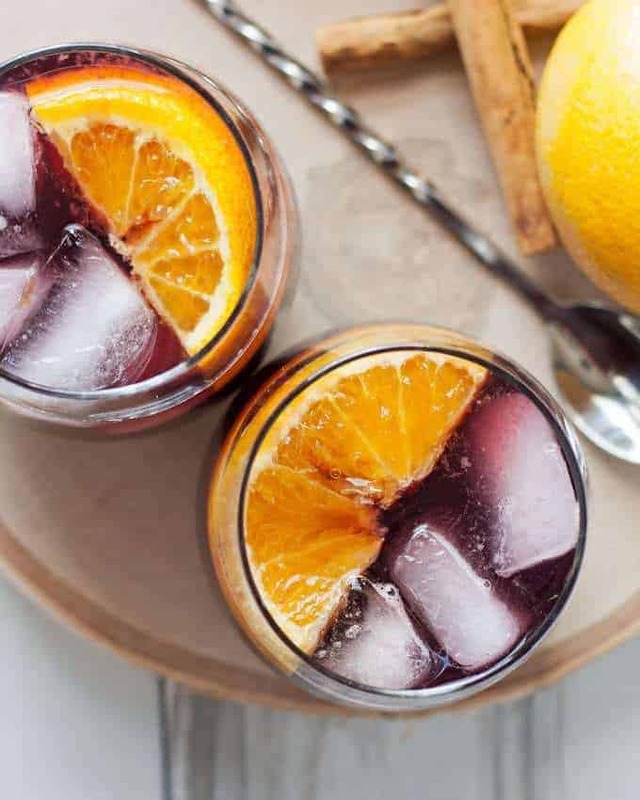 For this delicious orange red wine spritzer, I ran out to the store and bought some orange bitters. Because believe it or not, I didn’t have any in my home. I feel like me saying that, as a cocktail creator, is a little blasphemous. But truth is truth – what can I do? We had lemon bitters and all of the ingredients and components to make DIY bitters and that just wasn’t going to work for my idea. 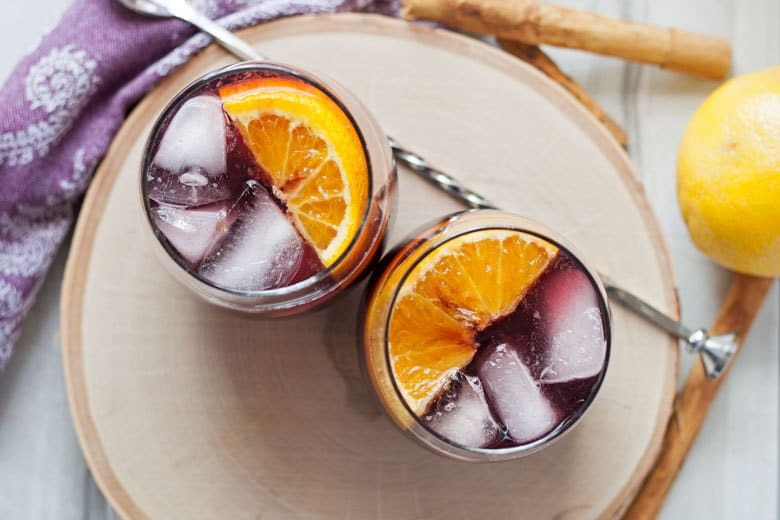 When I started planning this red wine cocktail, I did a ton of research on orange bitters. I also grabbed my favorite cocktail shaker. 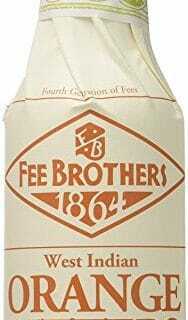 Back in the not-so-distant past, there was one brand of orange bitters and you could maybe find it at the store. Now there are many options and many flavors, which lead to many different and awesome cocktails. I went to Binny’s, our local liquor emporium, and stood in front of the bitters display. It was overwhelming. Thankfully I did my research. 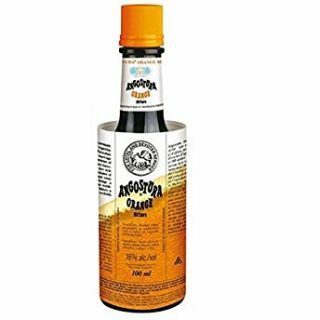 I finally decided on a bottle of Angostura, bought it and brought it home. We made this drink with some homemade cinnamon simple syrup on a Sunday afternoon. Mr. B was all about it! He is the best recipe tester, no joke. I couldn’t pinpoint whether I wanted more bitters or more orange juice and he really helped me. 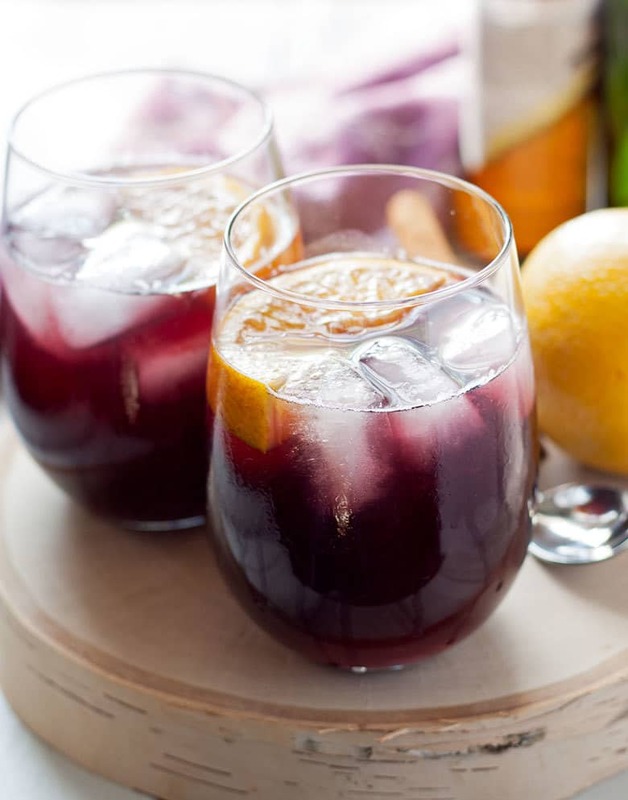 So grab that final glass of wine from last night’s bottle and try this red wine cocktail today. Or, even better, make a whole pitcher! 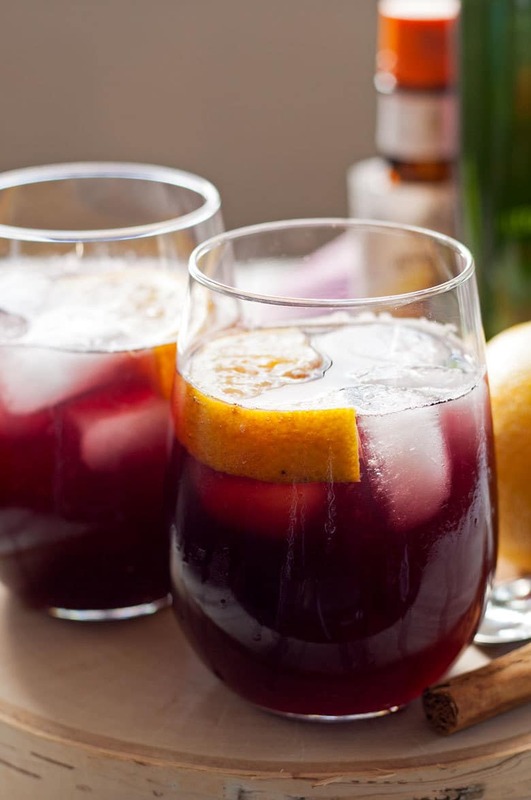 It’s like winter sangria but quicker. 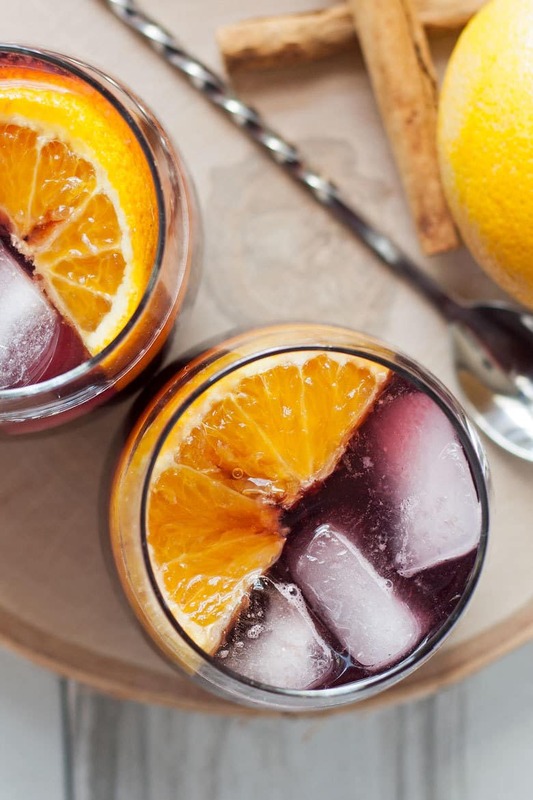 This orange red wine spritzer is a great cocktail for fall and winter. Mix up a batch of cinnamon simple syrup, grab a bottle of your favorite red and try this drink today! 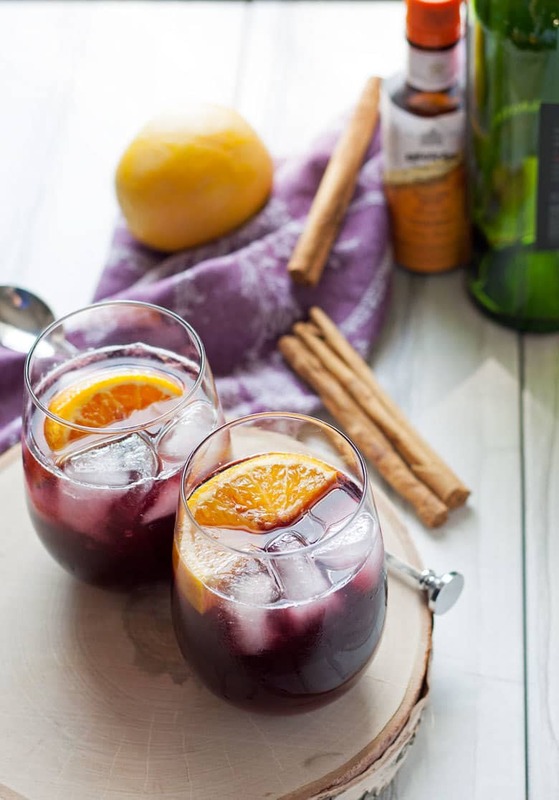 In a glass filled with ice, combine the red wine, orange juice and cinnamon simple syrup. Stir well. Top with soda water. Add the orange bitters to taste. To make the cinnamon simple syrup, combine all ingredients in a small pot. Bring to a boil and then turn off heat. Let sit for 2 hours. 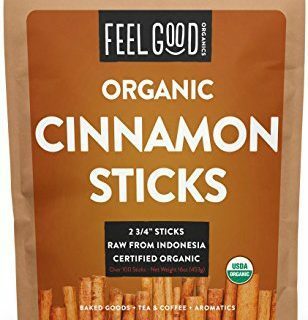 Strain out the cinnamon sticks and store in a storage container. This is my kind of cocktail! Perfect for fall. Jenny, I have the perfect bottle of wine to try this with — it’s an inexpensive but quite drinkable pinot noir I picked up the other day for cooking. When I open it, I’ll save a little for one of these gorgeous drinks. Cheers! I end up putting a splash of orange bitters in pretty much every cocktail. Who knew something so tiny could contribute SO much?! Cheers! What a great drink. I love the cinnamon simple syrup – great for this time of year. I’m blown away by your photos – gorgeous! Thank you Patricia! I plan on using cinnamon simple syrup all season long – it is yummy! Yes!!! It is calling your name!! Love this and featured it on Sunday Features this week! Loved the recipe! Thank you for sharing! I’ve actually never used orange bitters, so this was a fun recipe to try. I’ll have to try the biters in other cocktails as well because it’s delicious. Cheers! Yay, I’m glad you circled back to tell me you liked it! I am going to be sharing a new cocktail with orange bitters soon so keep an eye out for it. Cheers! I’m not much of a drinker… but this sounds delicious. Pinned! Sounds yummy. I’ve never tried one with orange before. Thanks for sharing at the #InspirationSpotlight Pinned & shared. See you again soon! This sounds simply delightful!! Thanks for sharing at the What’s for Dinner linky – and don’t forget to leave a comment – if you comment and your post is featured next week, it will also get pinned and tweeted! Yum! can’t wait to try this in the fall! Thank you for sharing on Family Joy Blog Link-Up Party. Hope you are having a great week! This looks so pretty and refreshing! Thanks for linking up with What’s Cookin’ Wednesday! Pretty & looks so delicious. Thanks for sharing at the #InspirationSpotlight Party. Pinned & shared.